Microimplantes en Ortodoncia: movimiento tridimensional de molares. el espacio del 47 mediante ortodoncia y no mediante el reemplazo protésico. Docente de Fundación Gnathos (Argentina). Arbuckle GR, Nelson CL, Roberts WE. (1991) Osseointegrated implants and orthodontics. Oral Maxillofac Surg Clin North Am;3:903-919.
mini-implants used for orthodontic anchorage. Clinical Oral Implants Research;16(4): 473-479. Chen Y-J et al. (2007) A retrospective analysis of the failure rate of three different orthodontic skeletal anchorage systems. Clin Oral Implants Res;18(6):768-775. Chung KR. (2001) C-implant. In: Chung KR, ed. Text Book of Speedy Orthodontics. Seoul, South Korea: Jeesung. Kanomi R. (1997) Mini-implant for orthodontic anchorage. J Clin Orthod; 31:763-767. Maino BG, Bender J, Pagin P, Mura P. (2003) The spider screw for skeletal anchorage. J Clin Orthod; 37:90-97. Park H-S, Lee S-K, Kwon O-W. (2005) Group distal movement of teeth using microscrew implant anchorage. Angle Orthodontist 75:602-609. Roberts WE, Nelson CL, Goodacre CJ. (1994) Rigid implant anchorage to close a mandibular first molar extraction site. J Clin Orthod; 28:693-704. Umemori M, Sugawara J, Mitani H, Nagasaka H, Kawamura H. (1999) Skeletal anchorage system for open-bite correction. Am J Orthod Dentofacial Orthop;115:166-174.
a prospective clinical study. Clin Oral Implants Res; 18(2):263-267. GREGORET, Gustavo. Microimplantes en Ortodoncia: movimiento tridimensional de molares.. Actas Odontológicas (Publicación discontinuada), [S.l. ], v. 8, n. 1, p. 28-35, mar. 2016. ISSN 2393-6304. 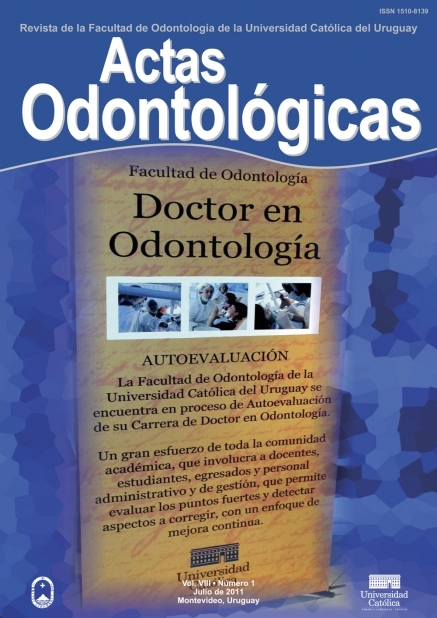 Disponible en: <http://revistas.ucu.edu.uy/index.php/actasodontologicas/article/view/1046>. Fecha de acceso: 23 apr. 2019 doi: https://doi.org/10.22235/ao.v8i1.1046.